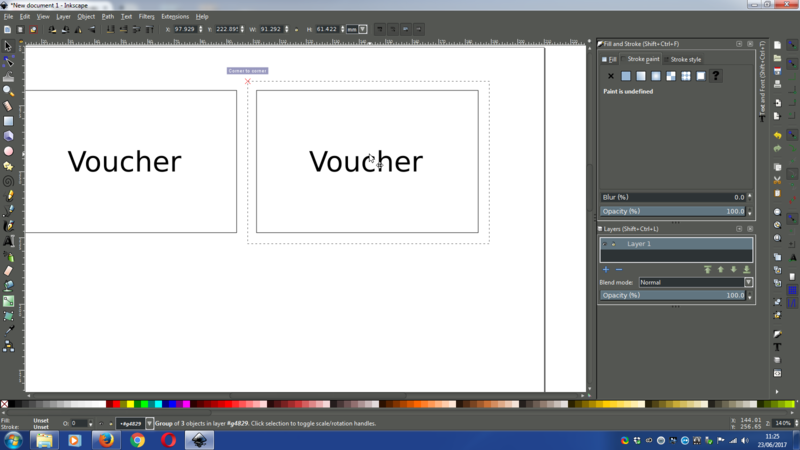 I'm creating a quick design for some vouchers in Inkscape to be printed on a sheet of paper and cut out. I want to leave some space around the voucher design, to give a nice white border after cutting. Using the built-in alignment tools, I am able to create a nice grid, but this gives me a |1x1x1x1| spacing (where | is the page edge and x is a voucher object). After cutting, this means that some sides have double the white space on the side as others. 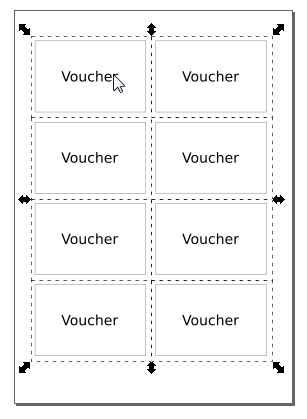 How do I set the spacing between these vouchers to follow a |1x2x2x1| pattern, so that I have an equal 1-width border around each voucher after printing and cutting? If you create a shape around your voucher with no fill and no stroke, and group it with your voucher artwork, then you could enable snapping to place copies in the right position. There's no need to use grids/guides at all. Not the answer you're looking for? Browse other questions tagged inkscape white-space or ask your own question. How to create dynamic boolean masked objects in inkscape? Is there a general rule regarding font spacing?